I took this in the Mohonk Mountain House in New Paltz, NY. 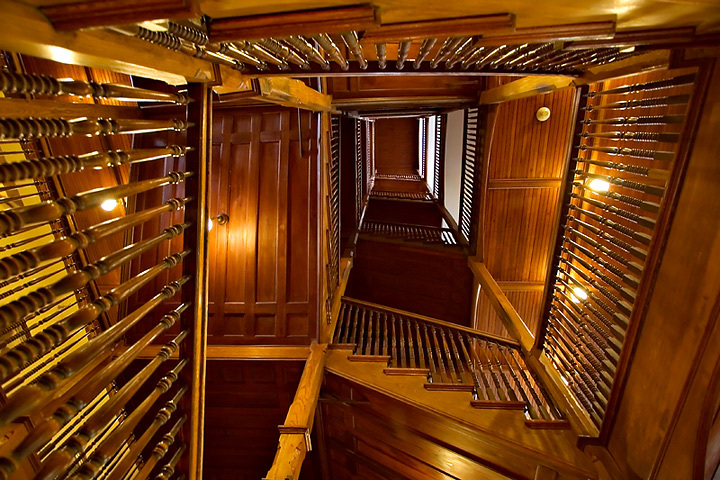 I was looking up the staircase in the main lobby of the hotel. The camera was handheld. I processed the original raw file using CS2 Camera Raw. In CS2 I used the Velviavision plug-in to increase contrast, warm the color, increase saturation and add dynamic range. I also resized and cropped the image and used USM to sharpen and increase contrast. This is such a cool image! Looks like one of those impossible drawings by Escher or the like, except in color. And what vivid color! Excellent image. If I ever get to one of the conferences held at the Mohonk, I'll be looking for this. Man...what am I looking at here? Pretty neat. ay-yi-yi, i LOVE it. this has an incredible hitchcock feel to it. very, very nicely done. Incredible depth of field on this. The tones and detail are great! Every time I look at this I get dizzy. It is just so cool that I don't even know what adjectives to use to describe it! This reminds me of Escher's work. Love the repeating pattern! I keep looking for "Waldo" though! Busy but I like it! Neat perspective. Quite a fascinating shot. Requires you to spend time on it. Nice job! wicked cool. Lots of depth. My God this is Escheresch! I get a bit dizzy looking at this photo, Less red/yellow would have done better for this photo (in my opinion), but I like your idea! reminds me of MC Escher. Great POV. I'm Dizzy !!! Great shot ! Amazing persepctive - very dramatic. I'm getting an Escher feeling. Nice Job. Proudly hosted by Sargasso Networks. Current Server Time: 04/20/2019 10:10:32 PM EDT.